Rufus Amos Carter, Son of James W. Carter, Jr., and the late Viola Carter, was born December 11, 1965 in Wise, North Carolina. He departed this life on Monday, July 9th, 2018 at Maria Parham Health of Henderson, NC. Rufus was baptized at an early age, and joined the Bethlehem Baptist Church in Wise, North Carolina. He received his education in the Warren County public school system, and graduated in 1984. Rufus was CEO of his own security firm, named The Carter Firm, where he led the security of Neyo, Kirk Franklin, Mindless Behavior, Chris Brown, and many more. His mother, Mrs. Viola Carter preceded him in death. Funeral services were conducted Saturday, July 14, 2018 at Warren County Middle School. Reverend Preston Williams, Pastor of Bethlehem Baptist will deliver the eulogy. Interment followed in the Bethlehem Baptist Church Cemetery. 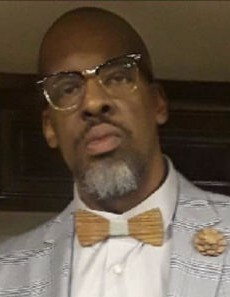 Rufus leaves to cherish his memory, his father: James W. Carter, Sr.; six sons: Cordell Bullock and Brandon Carter of Henderson, NC, Bryce Bland of Richmond, VA; twin sons: Christian and Jeremy Dorsette of Brooklyn, NY, and Tyler Soto of Atlanta, GA; five grandchildren: Samarion, Kemarion, Savion, Kianah Carter, and Naomi Amos Bland; four sisters: Mildred Hendricks, Thelma Carter (Herbert) of Norlina, NC, Yolanda Carter of Waldorf, MD, and Jackie C. Lassiter (George) of Hampton, VA; six brothers: Reverend James Carter, Jr. (Alean) of Copiague Long Island, NY, Andrew Carter of Norlina, NC, Robert Carter (LaGretta) of Wise, NC, Roy Carter (Catherine) of Soul City, NC, Derrick Carter (Mary) of Warrenton, NC, Erick Carter (Jamila) of Waldorf, MD; Nephews, one raised as a Brother (Tony Carter); thirteen nieces, one special niece; Tonya Carter; four uncles; and four aunts; Rufus had lots of friends, two special ones that he cherished from grade school, and throughout his adult life: Donials Fogg, and Florice Davis; and a host of other loving relatives and friends. Mr. Carter may be viewed today in the R. H. Greene Funeral Home Chapel from 11:00 AM until 7:00 PM, and at The Arrangements are Entrusted to R. H. Greene Funeral Home of Warrenton, NC.